How are you doing? This is Mitsue writing again. Christmas is just around the corner, and we have many things to do at this time. 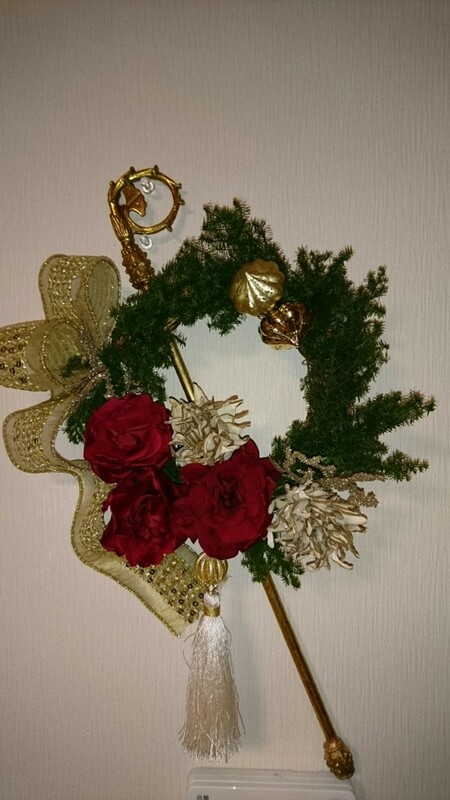 During the busy days, I enjoyed making Christmas wreath of preserved flowers. Preserved flowers are natural plants that have been processed with revolutionary technology to maintain their fresh appearance for several months or even years. Their beauty and delicate appearance make it difficult to distinguish between fresh flowers and preserved ones. 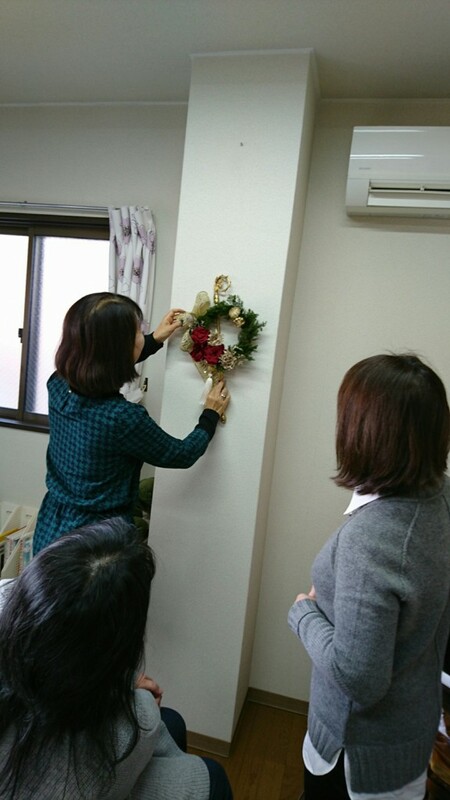 The woman standing beside the wreath is my teacher of preserved flower arrangement. She is very fashionable and often enjoys traveling with her husband. Her daughter has married on June, and she showed many pictures of the wedding. The ceremony was held at Kasuga Taisha in Nara city. It is a shinto shrine established in 768 AD and rebuilt several times over the centuries. It is named from the architectural style of Kasuga-zukuri characterized for its sloping roof extending over the front of the building. The path to Kasuga Taisha passes through the Nara Park where deer inhabit. Deer are believed to be sacred messengers of the Shinto gods. Over three thousand stone lanterns donated by worshipers line up along the path. The lanterns are only lit twice a year during two Lantern Festivals, one in early February and one in mid August. Kasuga Taisha and the Kasugayama Primeval Forest near it, are registered as a UNESCO World Heritage Site as part of the "Historic Monuments of Ancient Nara". Look at the top picture. 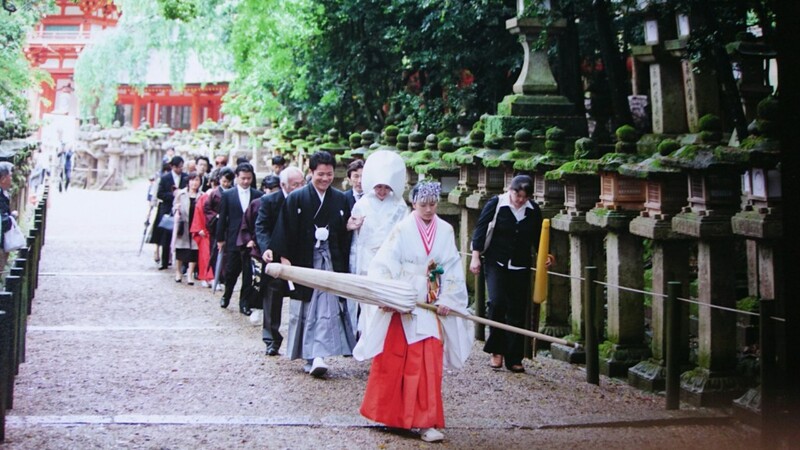 It shows the bride and bridegroom are walking through the path to approach the honden (main sanctuary). Their parents and relatives are following them. 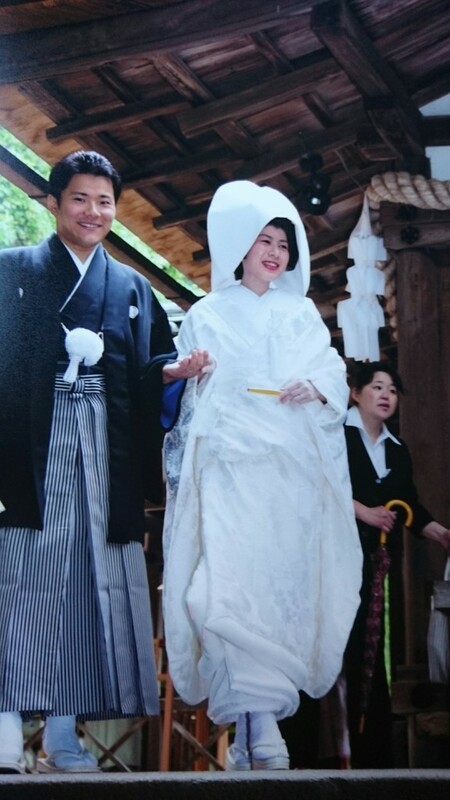 The bride is wearing beautiful Shiromuku (pure white kimono) and wata-boshi (white bag-formed headdress), and the bridegroom is wearing hakama (man's formal divided skirt). 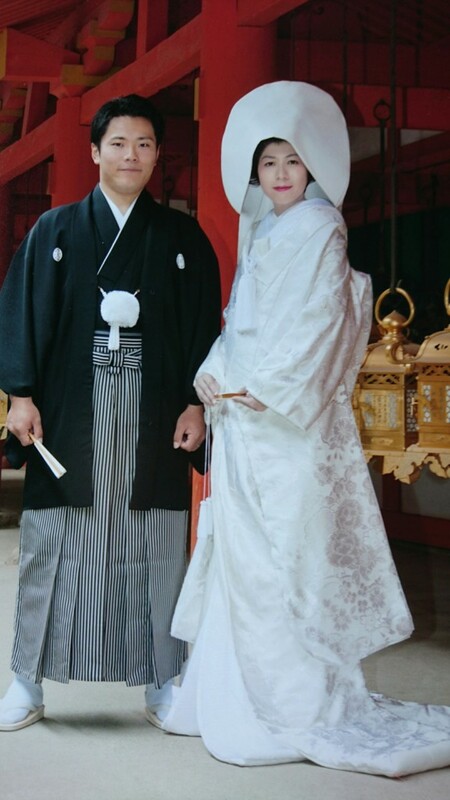 Wedding ceremony was held at honden with shinto style, and they walked down the corridor. 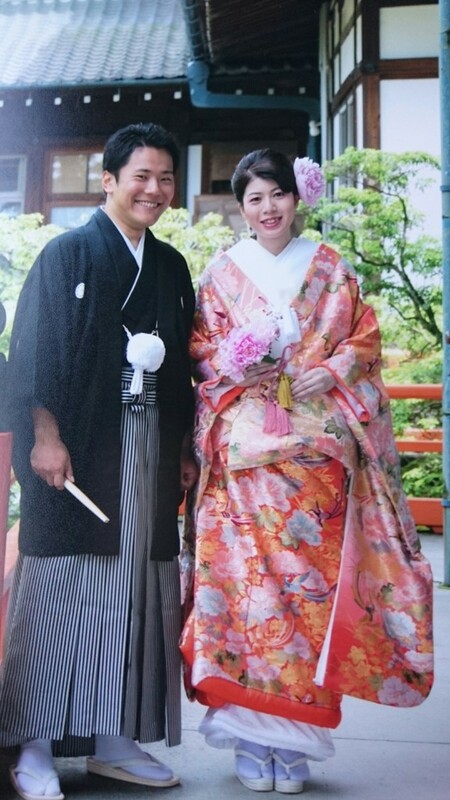 After the ceremony, the bride changed to gorgeous red Uchikake with flower pattern and gold glazing. Did you notice the bouquet and hair ornament of the bride? They were made by her mother with preserved flowers. (Yes, my teacher!) I heard the bride wore two more Western dresses with another bouquets at a wedding party. Oh, how wonderful!! 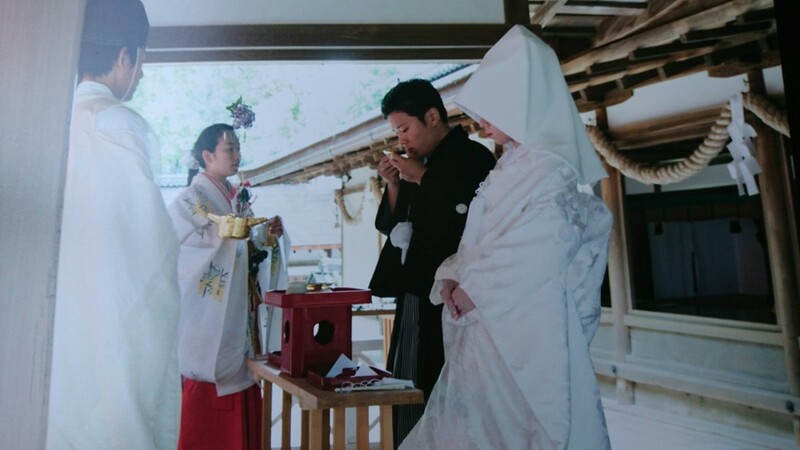 Just like in ancient times, services such as wedding, 7-5-3 and Omiyamairi (pray for new born baby) are offered at Kasuga Taisha, and many religious festivals are held here annually. Still today, prayers are offered for national and global peace, and for the happiness and well-being of all people. Well, I've never worn Shiromuku nor Uchikake in my life. I would like to wear them and take pictures if I were 20 years younger...How do you think? If you want to wear them at your wedding or take some pictures for your memories, ICHIROYA is always ready for lots of items. It will be also nice enjoying fabulous ones for interior display in your room? Thank you for reading. Hope you have nice Christmas holidays!